One of the best things about modern cryptography is the beautiful terminology. You could start any number of punk bands (or Tumblrs) named after cryptography terms like ‘hard-core predicate’, ‘trapdoor function’, ‘ or ‘impossible differential cryptanalysis’. And of course, I haven’t even mentioned the one term that surpasses all of these. That term is ‘zero knowledge‘. In fact, the term ‘zero knowledge’ is so appealing that it leads to problems. People misuse it, assuming that zero knowledge must be synonymous with ‘really, really secure‘. Hence it gets tacked onto all kinds of stuff — like encryption systems and anonymity networks — that really have nothing to do with true zero knowledge protocols. This all serves to underscore a point: zero-knowledge proofs are one of the most powerful tools cryptographers have ever devised. But unfortunately they’re also relatively poorly understood. In this series of posts I’m going try to give a (mostly) non–mathematical description of what ZK proofs are, and what makes them so special. In this post and the next I’ll talk about some of the ZK protocols we actually use. Prior to Goldwasser et al., most work in this area focused the soundness of the proof system. That is, it considered the case where a malicious Prover attempts to ‘trick’ a Verifier into believing a false statement. What Goldwasser, Micali and Rackoff did was to turn this problem on its head. Instead of worrying only about the Prover, they asked: what happens if you don’t trust the Verifier? The specific concern they raised was information leakage. Concretely, they asked, how much extra information is the Verifier going to learn during the course of this proof, beyond the mere fact that the statement is true? It’s important to note that this is not simply of theoretical interest. There are real, practical applications where this kind of thing matters. Here’s one: imagine that a real-world client wishes to log into a web server using a password. The standard ‘real world’ approach to this problem involves storing a hashed version of the password on the server. The login can thus be viewed as a sort of ‘proof’ that a given password hash is the output of a hash function on some password — and more to the point, that the client actually knows the password. Most real systems implement this ‘proof’ in the absolute worst possible way. The client simply transmits the original password to the server, which re-computes the password hash and compares it to the stored value. The problem here is obvious: at the conclusion of the protocol, the server has learned my cleartext password. Modern password hygiene therefore involves a good deal of praying that servers aren’t compromised. What Goldwasser, Micali and Rackoff proposed was a new hope for conducting such proofs. If fully realized, zero knowledge proofs would allow us to prove statements like the one above, while provably revealing no information beyond the single bit of information corresponding to ‘this statement is true’. So far this discussion has been pretty abstract. To make things a bit more concrete, let’s go ahead and give a ‘real’ example of a (slightly insane) zero knowledge protocol. For the purposes of this example, I’d like you to imagine that I’m a telecom magnate in the process of deploying a new cellular communications network. My network structure is represented by the graph below. Each vertex in this graph represents a cellular radio tower, and the connecting lines (edges) indicate locations where two cells overlap, meaning that their transmissions are likely to interfere with each other. This overlap is problematic, since it means that signals from adjacent towers are likely to scramble reception. Fortunately my network design allows me to configure each tower to one of three different frequency bands to avoid such interference. Of course, many of you will notice that what I’m describing here is simply an instance of the famous theory problem called the graph three-coloring problem. You might also know that what makes this problem interesting is that, for some graphs, it can be quite hard to find a solution, or even to determine if a solution exists. 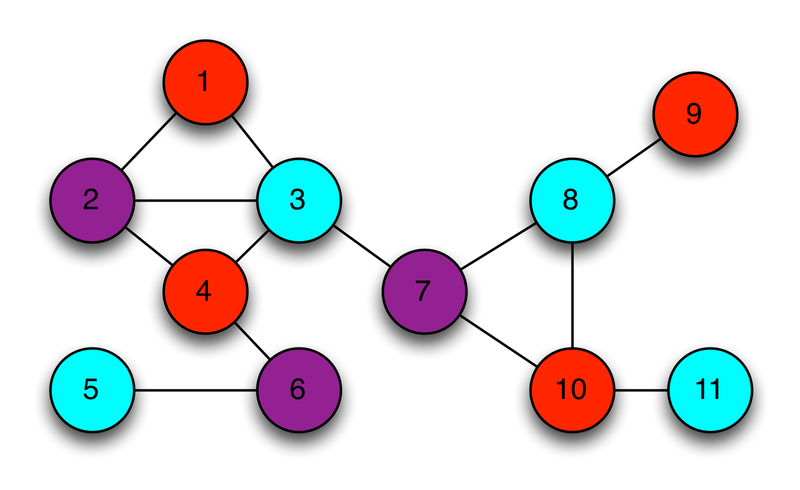 In fact, graph three-coloring — specifically, the decision problem of whether a given graph supports a solution with three colors — is known to be in the complexity class NP-complete. It goes without saying that the toy example above is easy to solve by hand. But what if it wasn’t? For example, imagine that my cellular network was very large and complex, so much so that the computing power at my disposal was not sufficient to find a solution. In this instance, it would be desirable to outsource the problem to someone else who has plenty of computing power. For example, I might hire my friends at Google to solve it for me on spec. But this leads to a problem. Suppose that Google devotes a large percentage of their computing infrastructure to searching for a valid coloring for my graph. I’m certainly not going to pay them until I know that they really have such a coloring. At the same time, Google isn’t going to give me a copy of their solution until I’ve paid up. We’ll wind up at an impasse. In real life there’s probably a common-sense answer to this dilemma, one that involves lawyers and escrow accounts. But this is not a blog about real life, it’s a blog about cryptography. And if you’ve ever read a crypto paper, you’ll understand that the right way to solve this problem is to dream up an absolutely crazy technical solution. First I will enter the warehouse, cover the floor with paper, and draw a blank representation of my cell network graph. Then I’ll exit the warehouse. Google can now enter enter, shuffle a collection of three crayons to pick a random assignment of the three agreed-upon crayon colors (red/blue/purple, as in the example above), and color in the graph in with their solution. Note that it doesn’t matter which specific crayons they use, only that the coloring is valid. Obviously this approach protects Google’s secret coloring perfectly. But it doesn’t help me at all. For all I know, Google might have filled in the graph with a random, invalid solution. They might not even have colored the graph at all. If the two revealed vertices are the same color (or aren’t colored in at all!) then I definitely know that Google is lying to me. Clearly I’m not going to pay Google a cent. If the two revealed vertices are different colors, then Google might not be lying to me. Hopefully the first proposition is obvious. The second one requires a bit more consideration. The problem is that even after our experiment, Google could still be lying to me — after all, I only looked under two of the hats. If there are E different edges in the graph, then Google could fill in an invalid solution and still get away with it most of the time. Specifically, after one test they could succeed in cheating me with probability up to (E-1)/E (which for a 1,000 edge graph works out to 99.9% of the time). Fortunately Google has an answer to this. We’ll just run the protocol again! We put down fresh paper with a new, blank copy of the graph. Google now picks a new (random) shuffle of the three crayons. Next they fill in the graph with a valid solution, but using the new random ordering of the three colors. The hats go back on. I come back in and repeat the challenge process, picking a new random edge. Once again the logic above applies. Only this time if all goes well, I should now be slightly more confident that Google is telling me the truth. That’s because in order to cheat me, Google would have had to get lucky twice in a row. That can happen — but it happens with relatively lower probability. The chance that Google fools me twice in a row is now (E-1)/E * (E-1)/E (or about 99.8% probability for our 1,000 edge example above). Fortunately we don’t have to stop at two challenges. In fact, we can keep trying this over and over again until I’m confident that Google is probably telling me the truth. Note that I’ll never be perfectly certain that Google is being honest — there’s always going to be a tiny probability that they’re cheating me. But after a large number of iterations (E^2, as it happens) I can eventually raise my confidence to the point where Google can only cheat me with negligible probability — low enough that for all practical purposes it’s not worth worrying about. And then I’ll be able to safely hand Google my money. What you need to believe is that Google is also protected. Even if I try to learn something about their solution by keeping notes between protocol runs, it shouldn’t matter. I’m foiled by Google’s decision to randomize their color choices between each iteration. The limited information I obtain does me no good, and there’s no way for me to link the data I learn between interactions. What makes it ‘zero knowledge’? I’ve claimed to you that this protocol leaks no information about Google’s solution. But don’t let me get away with this! The first rule of modern cryptography is never to trust people who claim such things without proof. Completeness. If Google is telling the truth, then they will eventually convince me (at least with high probability). Soundness. Google can only convince me if they’re actually telling the truth. Zero-knowledgeness. (Yes it’s really called this.) I don’t learn anything else about Google’s solution. We’ve already discussed the argument for completeness. The protocol will eventually convince me (with a negligible error probability), provided we run it enough times. Soundness is also pretty easy to show here. If Google ever tries to cheat me, I will detect their treachery with overwhelming probability. The hard part here is the ‘zero knowledgeness’ property. To do this, we need to conduct a very strange thought experiment. First, let’s start with a crazy hypothetical. Imagine that Google’s engineers aren’t quite as capable as people make them out to be. They work on this problem for weeks and weeks, but they never manage to come up with a solution. With twelve hours to go until showtime, the Googlers get desperate. They decide to trick me into thinking they have a coloring for the graph, even though they don’t. Their idea is to sneak into the GoogleX workshop and borrow Google’s prototype time machine. Initially the plan is to travel backwards a few years and use the extra working time to take another crack at solving the problem. Unfortunately it turns out that, like most Google prototypes, the time machine has some limitations. Most critically: it’s only capable of going backwards in time four and a half minutes. So using the time machine to manufacture more working time is out. But still, it turns out that even this very limited technology can still be used to trick me. The plan is diabolically simple. Since Google doesn’t actually know a valid coloring for the graph, they’ll simply color the paper with a bunch of random colors, then put the hats on. If by sheer luck, I challenge them on a pair of vertices that happen to be different colors, everyone will heave a sigh of relief and we’ll continue with the protocol. So far so good. Inevitably, though, I’m going to pull off a pair of hats and discover two vertices of the same color. In the normal protocol, Google would now be totally busted. And this is where the time machine comes in. Whenever Google finds themselves in this awkward situation, they simply fix it. That is, a designated Googler pulls a switch, ‘rewinds’ time about four minutes, and the Google team recolors the graph with a completely new random solution. Now they let time roll forward and try again. In effect, the time machine allows Google to ‘repair’ any accidents that happen during their bogus protocol execution, which makes the experience look totally legitimate to me. Since bad challenge results will occur only 1/3 of the time, the expected runtime of the protocol (from Google’s perspective) is only moderately greater than the time it takes to run the honest protocol. 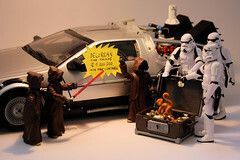 From my perspective I don’t even know that the extra time machine trips are happening. This last point is the most important. In fact, from my perspective, being unaware that the time machine is in the picture, the resulting interaction is exactly the same as the real thing. It’s statistically identical. And yet it’s worth pointing out again that in the time machine version, Google has absolutely no information about how to color the graph. What we’ve just shown is an example of a simulation. Note that in a world where time runs only forward and nobody can trick me with a time machine, the hat-based protocol is correct and sound, meaning that after E^2 rounds I should be convinced (with all but negligible probability) that the graph really is colorable and that Google is putting valid inputs into the protocol. What we’ve just shown is that if time doesn’t run only forward — specifically, if Google can ‘rewind’ my view of time — then they can fake a valid protocol run even if they have no information at all about the actual graph coloring. From my perspective, what’s the difference between the two protocol transcripts? When we consider the statistical distribution of the two, there’s no difference at all. Both convey exactly the same amount of useful information. Believe it or not, this proves something very important. Specifically, assume that I (the Verifier) have some strategy that ‘extracts’ useful information about Google’s coloring after observing an execution of the honest protocol. Then my strategy should work equally well in the case where I’m being fooled with a time machine. The protocol runs are, from my perspective, statistically identical. I physically cannot tell the difference. Thus if the amount of information I can extract is identical in the ‘real experiment’ and the ‘time machine experiment’, yet the amount of information Google puts into the ‘time machine’ experiment is exactly zero — then this implies that even in the real world the protocol must not leak any useful information. 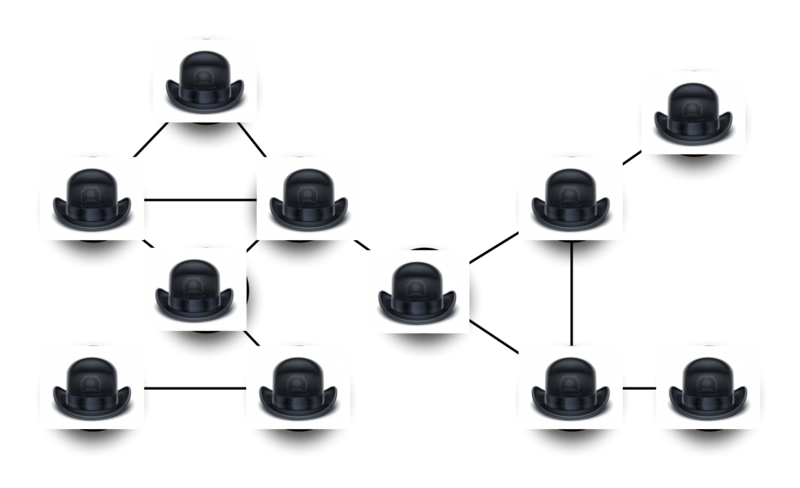 Of course we don’t actually want to run a protocol with hats. And even Google (probably?) doesn’t have a literal time machine. To tie things together, we first need to bring our protocol into the digital world. This requires that we construct the digital equivalent of a ‘hat’: something that both hides a digital value, while simultaneously ‘binding’ (or ‘committing’) the maker to it, so she can’t change her mind after the fact. Given a commitment scheme, we now have all the ingredients we need to run the zero knowledge protocol electronically. The Prover first encodes its vertex colorings as a set of digital messages (for example, the numbers 0, 1, 2), then generates digital commitments to each one. These commitments get sent over to the Verifier. 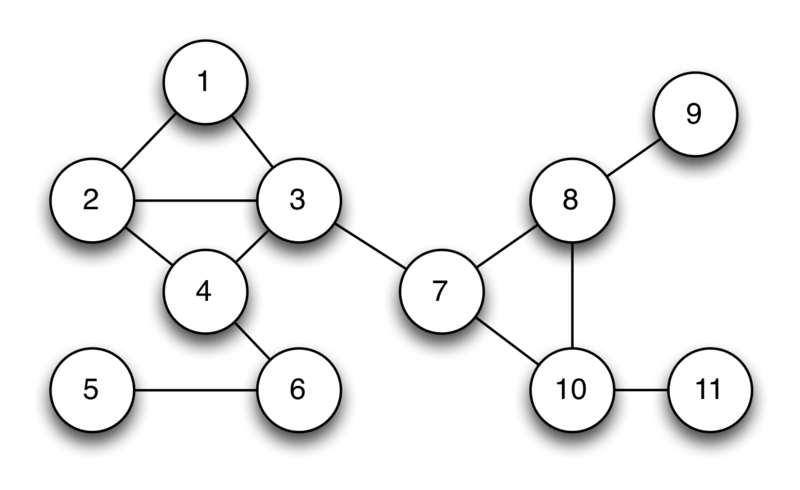 When the Verifier challenges on an edge, the Prover simply reveals the opening values for the commitments corresponding to the two vertices. So we’ve managed to eliminate the hats. But how do we prove that this protocol is zero knowledge? What we can now prove is the following theorem: if you could ever come up with a computer program (for the Verifier) that extracts useful information after participating in a run of the protocol, then it would be possible to use a ‘time machine’ on that program in order to make it extract the same amount of useful information from a ‘fake’ run of the protocol where the Prover doesn’t put in any information to begin with. And since we’re now talking about computer programs, it should be obvious that rewinding time isn’t such an extraordinary feat at all. In fact, we rewind computer programs all the time. For example, consider using virtual machine software with a snapshot capability. initial snapshot, then execution is forked to a new path. Even if you don’t have fancy virtual machine software, any computer program can be ‘rewound’ to an earlier state, simply by starting the program over again from the beginning and feeding it exactly the same inputs. Provided that the inputs — including all random numbers — are fixed, the program will always follow the same execution path. Thus you can rewind a program just by running it from the start and ‘forking’ its execution when it reaches some desired point. Ultimately what we get is the following theorem. If there exists any Verifier computer program that successfully extracts information by interactively running this protocol with some Prover, then we can simply use the rewinding trick on that program to commit to a random solution, then ‘trick’ the Verifier by rewinding its execution whenever we can’t answer its challenge correctly. The same logic holds as we gave above: if such a Verifier succeeds in extracting information after running the real protocol, then it should be able to extract the same amount of information from the simulated, rewinding-based protocol. But since there’s no information going into the simulated protocol, there’s no information to extract. Thus the information the Verifier can extract must always be zero. So let’s recap. We know that the protocol is complete and sound, based on our analysis above. The soundness argument holds in any situation where we know that nobody is fiddling with time — that is, the Verifier is running normally and nobody is rewinding its execution. At the same time, the protocol is also zero knowledge. To prove this, we showed that any Verifier program that succeeds in extracting information must also be able to extract information from a protocol run where rewinding is used and no information is available in the first place. Which leads to an obvious contradiction, and tells us that the protocol can’t leak information in either situation. There’s an important benefit to all this. Since it’s trivial for anyone to ‘fake’ a protocol transcript, even after Google proves to me that they have a solution, I can’t re-play a recording of the protocol transcript to prove anything to anyone else (say, a judge). That’s because the judge would have no guarantee that the video was recorded honestly, and that I didn’t simply edit in the same way Google might have done using the time machine. This means that protocol transcripts themselves contain no information. The protocol is only meaningful if I myself participated, and I can be sure that it happened in real time. Proofs for all of NP! If you’ve made it this far, I’m pretty sure you’re ready for the big news. Which is that 3-coloring cellphone networks isn’t all that interesting of a problem — at least, not in and of itself. The really interesting thing about the 3-coloring problem is that it’s in the class NP-complete. To put this informally, the wonderful thing about such problems is that any other problem in the class NP can be translated into an instance of that problem.In a single stroke, this result — due to Goldreich, Micali and Wigderson — proves that ‘efficient’ ZK proofs exists for a vast class of useful statements, many of which are way more interesting than assigning frequencies to cellular networks. You simply find a statement (in NP) that you wish to prove, such as our hash function example from above, then translate it into an instance of the 3-coloring problem. At that point you simply run the digital version of the hat protocol. Of course, actually running this protocol for interesting statements would be an insanely silly thing for anyone to do, since the cost of doing so would include the total size of the original statement and witness, plus the reduction cost to convert it into a graph, plus the E^2 protocol rounds you’d have to conduct in order to convince someone that the proof is valid. Theoretically this is ‘efficient’, since the total cost of the proof would be polynomial in the input size, but in practice it would be anything but. So what we’ve shown so far is that such proofs are possible. It remains for us to actually find proofs that are practical enough for real-world use. In the next post I’ll talk about some of those — specifically, the efficient proofs that we use for various useful statements. I’ll give some examples (from real applications) where these things have been used. Also at reader request: I’ll also talk about why I dislike SRP so much. * Formally, the goal of an interactive proof is to convince the Verifier that a particular string belongs to some language. Typically the Prover is very powerful (unbounded), but the Verifier is limited in computation. ** This example is based on the original solution of Goldwasser, Micali and Rackoff, and the teaching example using hats is based on an explanation by Silvio Micali. I take credit only for the silly mistakes. ****** A simple example of a commitment can be built using a hash function. To commit to the value “x” simply generate some (suitably long) string of random numbers, which we’ll call ‘salt’, and output the commitment C = Hash(salt || x). To open the commitment, you simply reveal ‘x’ and ‘salt’. Anyone can check that the original commitment is valid by recomputing the hash. This is secure under some (moderately strong) assumptions about the function itself. This is a great post, I've tried a few times in the past to get my head around how Zero Knowledge Proofs work and how they could be applied in practical situations and now I think I get it. I struggled a bit with the time machine thought experiment but once I got down to the part about VM Snapshots and rolling back code it all kind of clicked into place. Uhm…where are the dachshund pictures? Hi, any chance of dealing with non-interactive ZK proofs the next time? If prover and verifier are running on a VM, what happens if the choice of the verifier is saved to an external disc during transmission to the prover, then the VM is rewinded to the point before the decision and the prover already knows the decision because he can access the externally stored value, then recolors the graph (or the part in question) and successfully fools the verifier every time without actually having a valid solution? While the verifier indeed doesn't learn anything in the process, how is that actually a “proof”? It merely proofs the zero-knowledgeness, not the solution. This process could be applied easily all the time, making this kind of handshake pointless. There is no restriction on 4 and a half minutes either, the prover could submit all of his solution and still go back in time to change the whole submission. For the zero knowledge constraint, with any trick at least one information is extracted, time execution. the modified protocole (with time machine) will run longer then the supposed one, so if I have to challenge google I will try to understand how long it take them to reveal the two edge in the first place, now we are in the situation (never cheated, or always cheating) but in the case of (not cheated at least one time) the difference in time execution of the two version of the protocole (tricked and not) will be the information to extract. so here the zero knowledge isn't verified and at least I will know that google cheat on me for sure . Better make sure that the encoding of salt || x is unique in C = Hash(salt || x). In other words, there should be no possibility to transfer bytes between salt and x. Can you provide a link to the proof of the randomized algorithm and the zero-knowledge of this protocol ? Thanks as always for a great post, Matthew Green! I'm a math and cryptography n00b (& that's being generous) but greatly enjoyed your post. I *think* I grasped some measure of understanding. If anything, I greatly respect the creativity and rigour that sort of work calls upon. If only a modicum of that could make its way into the field of medicine/nutrition/exercise physiology, the world would be a slightly cooler place to inhabit. The time travel thought experiment / proof reminds me of Philosophy 101. Thank you Mr Green for another important piece. You aren't completely wrong ;). If the prover can rewind the verifier, the protocol doesn't prove anything. But in the real(non-simulated) world the prover can't rewind the verifier… The whole point of the time machine argument was to prove the zero-knowedgeness. Great post Matthew. Since i saw that you are planning on making this a series of post on ZK, i thought i would point you to the JKO paper “Zero-knowledge using garbled circuits: how to prove non-algebraic statements efficiently”. Its a neat application of GC and removes the need to convert the proof into a NP statement. Great introduction. I would like to emphasize one point that helped me in the past. 1. The Prover sets up a situation based upon his knowledge. 2. The Verifier challenges the Prover in some unpredictable way. 3. The Prover has to complete the Verifier's challenge to convince him a little more of his knowledge. This structure is not there by accident: it enables the zero-knowledge nature of the protocol. Also, any introduction on zero-knowledge protocols needs a reference to the paper 'Applied Kid Cryptography' by Naor, Naor and Goldreich: http://www.wisdom.weizmann.ac.il/~naor/PAPERS/waldo.pdf. What's preventing the verifier from brute forcing the commitments for other nodes once the prover reveals c and salt for 2 nodes? Or wait… The salt is not the same for all nodes. I believe you are incorrect here, since you're assuming a difference in time between real and fake inputs (assuming no time machine, in which case time can be rewound in just the same way and execution duration is not detectible). Any “lying” prover worth its salt is generating in constant time when compared to a true prover. Just like you should always verify two hashes are the same by checking all characters one at a time, rather than short circuiting on the first incorrect character, thus allowing statistical extrapolation of the secret. Your comment system is broken. I write something, I click publish and get back an empty form and nothing “published”. You should insert a short note about the non-zero-knowledge version where google doesn't change the coloring between “edge probes”. That's known as a covert timing channel. Google would be smart enough to close it. It's one of the basic things security folks look for. So anti-matter could (in theory) be used, to mess with this. Also, the conclusion is invalid, since Google doesn’t put zero information in there. They are effectively polling my knowledge of what I deem correct, and come up with a solution by trial and error. This is supported by the fact that they can very well come up with a completely correct graph, even without understanding what they do at all; making what they do a very slow but working algorithm. So the whole set of arguments that builds on that, falls flat on its face. > The protocol is only meaningful if I myself participated, and I can be sure that it happened in real time. All he has to do, is be the man-in-the-middle and/or mess with the message order on the verifier side (= messing up time). 1. It is impossible to know that it is THIS thing somebody’s trying to prove to you, unless you know what THIS thing is! 2. To know what THIS thing is, you have to have knowledge about it. 3. Ergo a zero knowledge proof is impossible, since you can never tell what is actually proven; only that it is. And to have prove on something undefined is by definition completely pointless. assume we have a verifier that could extract information. when we run that extractor against the random-coloring google with time machine, the extractor would still get the information. but it would not necessarily come from google, the algorithm could just as well incorporate the time machine and thus arrive at a viable solution. granted, given the time machine is not neede excessively in this case (from google's point of view, we're playing (e * 1 1/3)^2 iteratons), we'd have found a polynomial time algorithm, but we still wouldn't know if it's zero knowledge or not, as since we extract a valid solution from the random input, the information could have been leaked from the non-cheating google as well. size of provers data output, size of verifiers question, and other atributes of data is crucial to this protocol to actually work. data which you use and size of challenge, which is shown in this blog post is totally nonusable. Also verifier and prover NEED TO do ilustrated challenge response progressively thruout whole data until both sides can have whole data otherwise can prover lie to you undefinitely after first sucessful challenge(because you ask only about ONE CORNER OF GRAPH). Youre right in “real physical logical” world if you work with hats… If you work with data and you can work with hashes you dont need to know what real data is. Just example. You can use you laptop to calculate something, then use time machine and travel with right answer to exact time you needed that answer. So you dont need google at all. I think an important point is missing. When you use hashes as commitment scheme, how can the Prover “prove” to the Verifier that he used the same node color for the same node in different vertices? In other words, if you write “1 – 2” into all commitments, the Verifier can open any one and will see that it is fine. But if you allow to open more than one commitment from the same set, the zero-knowledgeness of the proof is violated as the user might open “A=1,B=2” and “B=2,C=1” and know that A and C have the same color. The problem is NP hard. If there were only 4 nodes (or some other small number Q), yes, you could brute force it. But if that was the case you'd be able to brute force the solution to Q + 2 much faster than waiting for google to come up with the solution to Q + 2 so what would be the point other than wasting google (and your) time? For any number of nodes >> Q, assuming google has a solution, you'd waste more time and energy trying to brute force the solution than simply checking their answer to a reasonable level and paying up. You seem to have misread the first few sentences. Zero knowledge means zero additional knowlege. If we're exchanging passwords for validation, you already know my hashed password and you know we are exchanging passwords. The zero knowledge means that in the process of our interaction, you don't gain any new/additional knowledge of my password than you already have. So you are saying that the extractor could extract information that is not present. In that case, the proof still holds since it extracted zero knowledge from google than google provided. Regarding soundness, surely at the time a prover is choosing a new set of random colours to colour the selected sample for the verifier, they could also take the opportunity to adjust the underlying solution so as to correct any local imperfections to their mapping. In other words, when the verifier points to a hat to remove, the prover looks first, and if and error is about to be revealed, it modifies the colours accordingly. This way it can make the whole solution appear correct without having to do the complex work of actually making a valid solution. What did I miss?